Finding a fracture does not alter the treatment as it should be treated as an undisplaced supracondylar fracture in children and as such should be treated with a cast. Independent of whether there’s a visible fracture or only a positive fat pad sign. MRI is the golden standard in fracture diagnosis as this can detect bony injury as well as small fractures. In only two studies an MRI exam was included of these only Al-Aubaidi examined children.3 MRI is often not available in an acute setting and costs a lot more than an x-ray. O’Dwyer et al. only included adults in their study. Since adults have different fracture sites (mainly radial head) compared to children (mainly condylar) the fat pad sign may have a different sensitivity and specificity in the adult population.7 Rabiner looked at posterior fat pad sign elevation, not at cortical disruption. It can be difficult to directly visualize fracture at the curved end of long bones and areas adjacent to joints. Ultrasonography may be of use in reducing the need for x-rays. Although this is a very interesting diagnostic modality the study will have to be repeated before we can really switch to ultrasound. It would be interesting to combine to try and directly visualize the fracture and visualize the ventral and posterior fat pad. Skaggs DL et al., The posterior fat pad sign in association with occult fracture of the elbow in children. J Bone Joint Surge Am 1999: 81: 1429-1433. 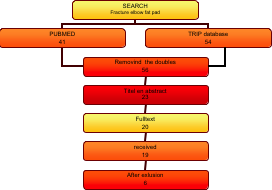 Donnelly traumatic elbow effusions in pediatric patients: are occult fractures the rule? AJR 1998 243-245.